The software you need – the way you need it! 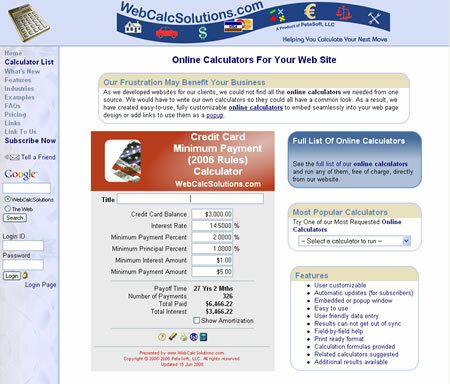 WebCalcSolutions.com is a website offering online calculators on a subscription basis.PeteSoft, LLC owns and operates this website and the site was fully conceptualized and developed by us. The Credit Card Minimum Payment Calculator featured on the home page is a fully functioning calculator embedded into the page. Notice how results are recalculated each time you change a value and tab out of that field. Move your cursor over any field prompt text to get help for that field or move your cursor over any output field to see the formula used in its calculation. These help and formula fields do not disappear after a few seconds, they will stay as long as your cursor is over the field. Print your results with or without formulas. A picture is worth a thousand words! Several of the calculators include an image with the field help when visualizing the text’s message is critical.This example shows the field help text and image for measuring the ‘Triceps’ skinfold. 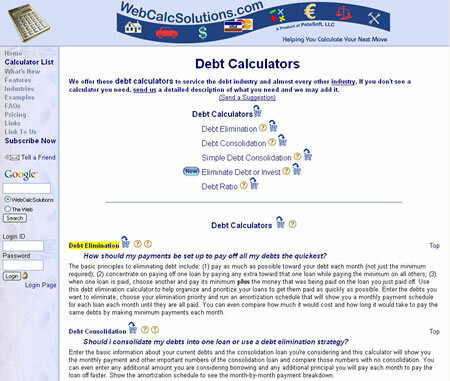 We offer lots of comparison calculators. 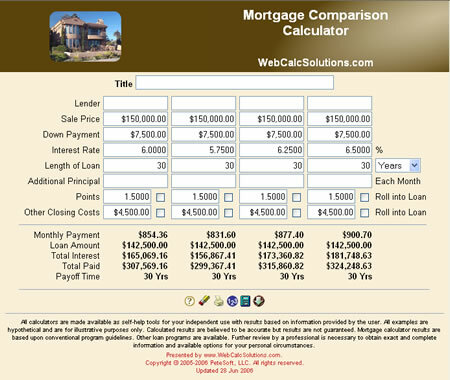 Comparison calculators let you look at the same loan with different variables like interest rate, down payment amount, or additional principal so you can see what variables make the most difference. The graphic, color scheme, fonts, and default values can be customized by the customer. 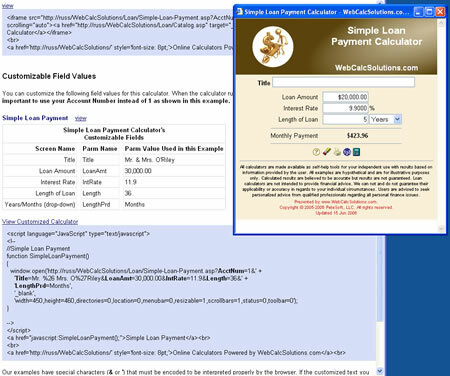 You can even turn off the popup help text and you can easily have the calculator start up with no default values.The background of this image shows the default values for the Simple Loan Payment Calculator. When you lookup a specific calculator, the page generates and displays the default values for the correct calculator. Can’t find what you linked to or searched for?